The Field Notes Left-handed notebook are designed specifically for left handed writers. Everything is the same as the standard Original Kraft notebook other than the direction of the notebook with the staples on the opposite side. Created with a Kraft color exterior and 48 pages of 60#T 3 1/2" x 5 1/2" lined bright white paper. 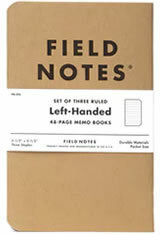 The Field Notes Left-handed Memo & Notebooks usually ships within 1 business day unless otherwise specified. Each Field Notes Left-handed Memo & Notebooks we sell is guaranteed to be genuine, authentic and will arrive brand new & unused!